Wherever you are, always remember that somewhere out there you have a comrade who’s watching your back. No matter where you are, there’s a Tripawd friend you can turn to when the going gets ruff. 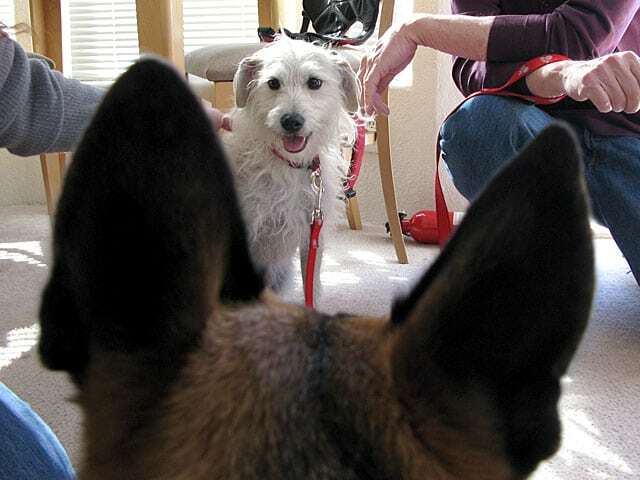 A few weeks ago I got to meet fellow Tripawd Ranger at our Tripawds Pawty in Nevada. Ranger is a Tripawd like me, but a little older. He thought I was just a kid because I kept getting in his face. Hey, isn’t that how you’re supposed to say “I wanna PLAY!”? Ranger made it very clear that he was in charge. I thought he was cool. See how I let him attack me? He thought I was obnoxious though. Still, we hung out and didn’t kill eachother. At the pawty, this white fluff ball showed up. I thought perhaps it was an appetizer. So I lunged toward it, and barked really loud to see what it was. But then the fluff ball jumped up! He was a scruffy little thing. After looking at him, I realized he would not have made the most satisfying meal. Then the scruffy appetizer let out a very. big. bark. “Whooooah buddy! I just wanna smell you! Chill!” I said to him. Rocket didn’t want to be my friend, and he took over the couch too. In fact, he looked pretty mad that he was there. His Mom, who is very sweet and beautiful, thought I was the greatest. She said I was a lot like her Spirit Rugby. I took that as a great compliment. After a while, Rocket calmed down and even fell asleep. Everyone gave him all sorts of attention. He’s supposed to be famous or something. He tolerated our racket for the afternoon though, and when it was over, you could tell he was glad to be outta there! 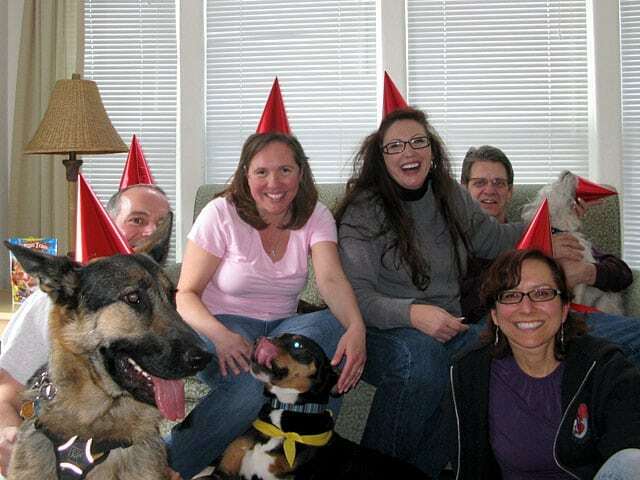 Before we said our goodbyes, Rocket’s Mom made us put on our silly hats, and take this picture to show the world that the Monkeydog versus Monkeybutt Match definitely didn’t lead to bloodshed. See how we’re all so hoppy? Everyone was so cool. 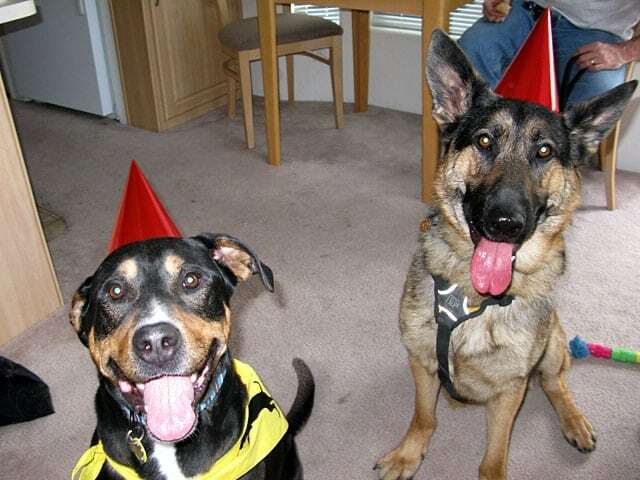 Thanks for coming to my pawty! Can we do it again sometime? I promise not to try to eat Rocket! what a great adventure wyatt!!! looks like you maybe met your match with ranger and rocket…you might have to turn to ‘out thinking’ them over ‘out barking’ them…. thanks for sharing the great pictures!! But barking is just sooooo much fun!!!! Oh My Dog! I missed this! Wyatt, you were just as I had hoped! If I didn’t have my monkeyboys, I’d would have sure wanted to take you home! SHUT UP! SHUT UP! SHUT UP! SHUT UP!SHUT UP! SHUT UP!SHUT UP! SHUT UP!SHUT UP! SHUT UP!SHUT UP! SHUT UP!SHUT UP! SHUT UP!SHUT UP! SHUT UP!SHUT UP! SHUT UP! We will meet again, you loud mouth! We will and I’ll be ready! I’ll bring my ear plugs and then we’ll go mano a mano! Ranger, you were cool for a stoopid tripawd! Where have I been??? I can’t believe I missed this! I had a really great time, and I know Ranger did too. Next time we need to find a big space that you two can run around and play (and maybe try to catch a certain flying Monkeybutt.) But no eating, just playing!